The Disnerd's little place: The tea tag! I've been away for a while, and though I won't make any promises on how I'll write more often, I will try to keep this blog looking a bit more alive! I'm very busy and tired pretty much all the time, so after clearing my head every night, I barely have any time left to do all the things I want to do (I bet you all know this feeling too!). Which is why I've been neglecting and abandoning my blog, for which I apologise. On to the brighter things: a new blog post, about tea! I've seen this post come up quite a few times on other blogs, and as I'm a big fan of tea myself (mostly during colder months) I decided to jump on the bandwagon and do my own tea tag blog post! Join me as I do the tea tag. When did you drink your first cup of tea and what did it taste like? Well, this is a hard one. I don't think I even remember my first cup of tea, so I most certainly don't know what it tasted like. I will take a wild guess at the kind though: it was either Earl Grey or English Breakfast tea as that's what my mom always drank at breakfast and I just joined in on that. Who do you like to drink tea with? Um, I mostly drink tea on my own as I don't really take time to sit down and have a cup of tea. I usually have a cup while reading a book or watching a movie or just working on my laptop. What time of day do you have a cup of tea? In the afternoon or at night. Chamomile or Rosehip+peach (which is weird since I absolutely don't like peach as a fruit, but I do like it when it's processed). How many times do you use one tea bag? Once. I tried using one bag twice, but the flavor just isn't the same with herbal teas. It does the job for black tea, but only when I let it infuse a bit longer. But as I don't drink black tea anymore, I only use a tea bag once. How do you feel about high tea? I have no idea as I've never experienced high tea before. I'm curious though! Judging by what I've seen in pictures, it looks like there's too much food and that I wouldn't need to have dinner after. Mostly in the grocery store, but on rare occasions, I buy some special kinds at specialty stores. Do you often try new flavors or do you stick with your regular tea? I stick with the kinds I know. I don't like buying new things because I'm afraid I won't like it and I'll end up having to throw it out. How do you preserve your tea? In the original container. That way I know when it'll turn bad and it's easier to find the kind I'm looking for. Do you have a separate box of tea for guests? No, I just let them browse my cupboard for the kind they want. If you could compose your own kind of tea, what flavor would it be? Something sweet, fruity and fresh. Something with loads of flavor (not the bland kind that only tastes good after adding five packs of Splenda). Maybe... Chamomile + peach + honey. And that concludes my tea tag! I hope you enjoyed my answers and maybe I inspired you to do this tag as well. 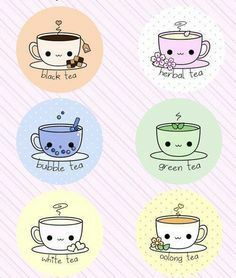 If you end up doing the tea tag, do let me know in the comments below, as I'm curious about your answers. Do you like tea? If so, what's your favourite flavor and why? I'm looking forward to know what kind of flavors you all like. Thank you so much for reading and replying!